Kansas City is abuzz about the Netflix show Queer Eye. The third season was filmed in and around the bistate region last year, and just aired in mid-March. One episode features a RideKC bus rider, 21-year-old Thomas. Each episode starts with a bio discussed by the Fab 5 as they drive to surprise their hero. But in Episode 7, Season 3, Queer Eye wanted to surprise Thomas on his bus ride. The KC Film Office put the show’s producers in touch with KCATA to help create the surprise. A handful of employees knew of RideKC’s involvement in filming. Due to the secretive nature of reality shows, the employees were not allowed to disclose RideKC’s participation in the show. However, eagle-eyed transit riders recognized the RideKC bus shown in the promo photo released in conjunction with Netflix’s announcement of the season premier date. Ersery hadn’t seen the show Queer Eye when he was given the assignment the day of the television shoot. The filming happened the same day President Trump was in downtown Kansas City, and Ersery was thankful he was going to be away from the road closures, heightened security and excitement downtown. Queer Eye star Karamo thanks bus driver Fred Ersery as Karamo exits the RideKC bus. Despite the excitement and sudden fame, Operator Ersery remains humble, and says it was just another day on the road. Ersery is assigned to the KCATA’s Extra Board, which means he fills in for any route that needs a bus operator. “There’s always something different, since I work the extra board. 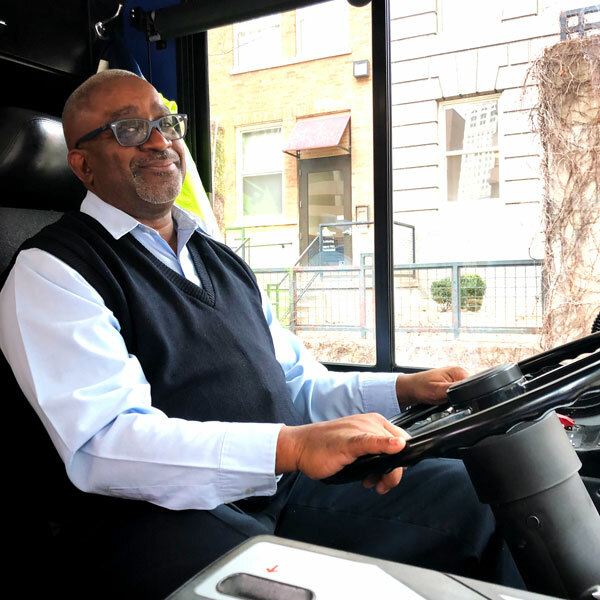 It’s a challenge to do different things every day.” For example, Ersery might drive and Troost MAX in the morning one day, and the next day he could be assigned to a route in Kansas City, Kansas that doesn’t start until after noon. And now television viewers across the city and across the globe see of one of Kansas City’s first class bus operators on Season 3, Episode 7 of Queer Eye.